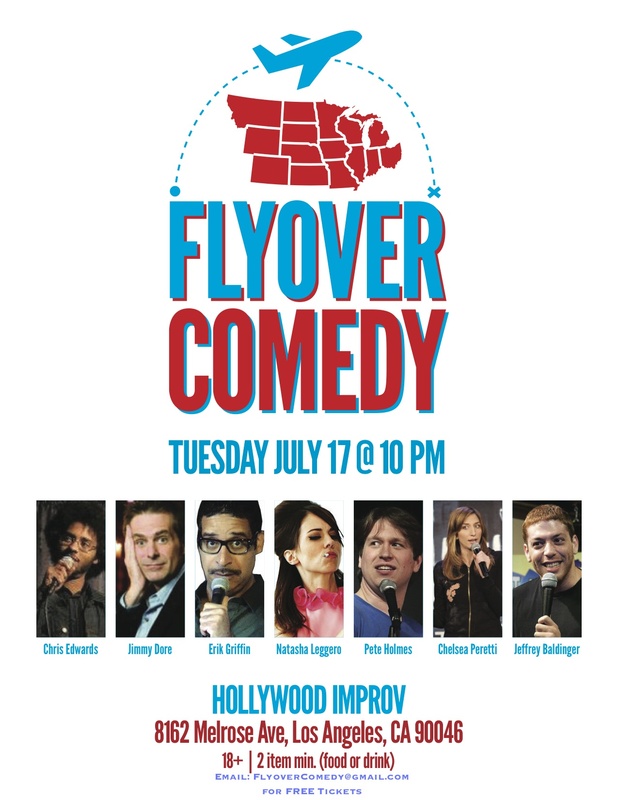 Seven rising stand-up comedians including Jeffrey Baldinger, Christopher Edwards, Pete Holmes, Natasha Leggero and more will take the stage at the Hollywood Improv on July 17. (Photo property of the Improv). Many people claim that Los Angeles is the entertainment capital of the United States. Besides heading to Disneyland or waiting in line to catch the latest taping of So You Think You Can Dance or the Price is Right, visitors and residents can always head to see several comedy clubs located around the metropolis. One comedy club that stands out amongst the elite is the Hollywood Improv. Almost every legendary and rising comedian has gotten their start on the franchised comedy club’s stage. On Tuesday, seven rising comedians will take the Hollywood Improv’s stage to impress the audience at a Flyover Comedy show highlighting the best rising comics from Illinois. Stand-up comedian Jeffrey Baldinger will be one of the comedians taking the stage and he corresponded with me to talk about the club, the show and what audience can expect from the show. Jacob Elyachar: For my readers, who have not had the chance to visit the Hollywood Improv…could you share a brief history of the comedy club with them? JE: Let’s talk about past performers, could you name several names in comedy that performed at the Hollywood Improv over the years? JB: Pretty much everyone you’ve ever heard of has performed at the Improv. From Richard Louis to Louis CK, all of the greats either got their start there or performed at any number of Improvs across the country. Performers include: Billy Crystal, Richard Pryor, Robert Klein, Lily Tomlin, Sarah Silverman, Freddy Prinze, Bill Hicks, Milton Berle, Adam Sandler, Drew Carey, Joe Rogan, Pablo Francisco, Dave Chappelle, Jim Carey, Gary Shandling, Robin Williams… the list could go on and on. JE: What makes the Hollywood Improv unique from most of the L.A. based comedy clubs? JB: Each club or venue in LA is great for different reasons. I suppose what makes The Hollywood Improv unique from the others is the vibe it puts out to both performers (young and old) and the audience members. Everybody is hanging out with everybody. They’ve had the same bartenders there for over 15 years, and there are only three spots you could be: the main showroom, the lab, or the bar. It’s very Cheers-ish in the sense that if you come and hang out long enough, everyone is going to eventually know your name. JE: How did the Flyover Comedy Show get started? JB: I love great comedy. I’d like it to be as accessible as possible, and the Improv gave me the opportunity to create my own show. That’s how Flyover Comedy was created. There are so many great comedians who are either originally from the Midwest, or came up comedically there, whether it be Chicago, Kansas City, or Minneapolis, etc. I wanted to do a show that highlighted that to audiences. At the end of the day, my goal has always been to be a comedian. I worked really hard to get this opportunity to create my own show, and now I’m working even harder to make sure it’s done right. I took the chance I was given, and I’m trying to do the best I can with it. JE: There are six other comedians joining you for the Flyover Comedy show. Could you tell my readers about them? JB: Each month highlights a different state and The Improv books comics who are from or have lived in that state. July is Illinois. On the line-up this month is host: Christopher Edwards, who was born and raised in Chicago, IL, moved out to Los Angeles about three years ago, one of the fastest rising stars in the comic community. He is a good friend of mine and he’s very hilarious. Pete Holmes, originally from Massachusetts, moved to Chicago and honed his comedic skills there, legitimately one of the best in the business. Natasha Leggero is originally from Rockford Illinois, she is on E!’s Chelsea Lately and she is one of the funniest comedians I’ve ever seen. Jimmy Dore also originally from Illinois, he lived in Chicago, he is smart, politically aware, and again, most importantly, ridiculously funny. I try to keep it state specific, but at the end of the day, I just want the show to be as funny as possible. Chelsea Peretti and Erik Griffin are not from Illinois, but they are both amazingly funny, so, it’s just a bonus for the audience. JE: What can audience members expect from this show? JB: Audience members can expect to laugh. They can expect to see amazing performers that they’d normally have to see on TV. They can also expect to see amazing performances from Comedians they’ve never heard of. The first show was hosted by Jeremiah Watkins, and had Chris Porter, Matt Braunger, Ian Edwards, Rory Scovel, Neal Brennan, and a surprise drop in set to close out the night by Dane Cook. Most everyone’s heard of Dane Cook and Neal Brennan (except for my parents) and while the others are all still national headliners, many aren’t household names. I received a lot of e-mails about each one, even Jeremiah, who’s not a national headliner, (not yet, he will be soon), trying to find out where they’re performing next or how they can see more of their stuff. The same can be expected at this show. You’ll see the national headliners and you’ll see comedians you’ve never heard of before and want to know where they’re all performing next. JE: If you had the chance to meet aspiring comedians who want to perform at the Improv, what advice would you give them? JB: For people wanting to perform at the Improv, my recommendation would be to go to some shows there, see what it’s like. Sign up for the open mic on Tuesdays at 5:30; it’s a great way to meet other comics who want to do the same thing as you do. Be patient, understand that it’s not an over night thing. Hone your craft. If you’re serious about it, you’ll start meeting bookers, and so on and so forth.